How is Saint Germain related to Uncle Sam? What are some of Saint Germain's incarnations? What would cause us to lose our freedom? Mrs. Prophet, could you tell us more about Saint Germain? 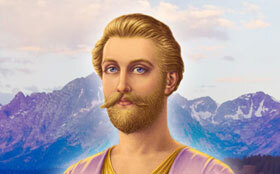 Saint Germain is the ascended master who is the chohan of the seventh ray of freedom. He is more than an ascended master to me—he is the very spirit of freedom in the heart of America. You may recall that I have spoken of him as the master of the Aquarian age. He is the master of the Aquarian age just as Jesus was the master of the Piscean age. I have spoken about the moment when I first contacted Saint Germain in this life—the moment when I saw his portrait by Charles Sindelar in a book of my mother's. At that moment, I remembered my calling. I know that I am not unique in that millions of Americans today feel the tie of their heart flame to our beloved Saint Germain, our Uncle Sam. He was embodied as the prophet Samuel, hence the name. Saint Germain overshadowed the early American patriots in the framing of the Constitution and in the designing of our flag. He even anointed our first president, George Washington. We have seen Saint Germain in his incarnations as Saint Joseph, Christopher Columbus, Francis Bacon and as Merlin at the court of Camelot. In the eighteenth century, as the Count Saint Germain, the Wonderman of Europe, he tried to save and unite Europe. When this attempt failed, he turned his attention toward the United States to form a more perfect union. Saint Germain is concerned about freedom and its preservation in every nation. He speaks out about the selling away of America—the giving away of her funds and technology. The American people should not have to bear the burden of the support of all nations. Saint Germain especially deplores the selling of military secrets, arms and weapons to those who turn around and use these against the sons and daughters of God in every nation. 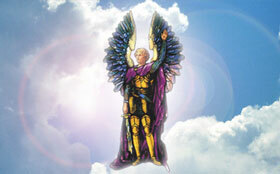 What does Saint Germain see as the biggest foe to freedom? Saint Germain has taught us that it is our own selfishness and self-indulgence that will cause us to lose our freedom. He inspires us to make greater sacrifices for freedom, to not indulge ourselves so much in luxuries but to realize that the calling and destiny of the American people is to guard freedom and to be the watchmen on the wall of freedom for the world. This involves sacrifice, but Saint Germain says that if we allow America to be the last remaining republic and the last place where full freedom is accorded the individual, we will not stand. Therefore he is for the defense of freedom in every nation and he holds us accountable for allowing the deaths of millions of people, as we have previously supported the totalitarian regimes that have taken over their nations. Saint Germain is determined that we should defend Taiwan as an island of people of light and that it should not become a football between East and West. He is also concerned that children in America receive the right education and the right understanding of our nation and its peculiar genius. 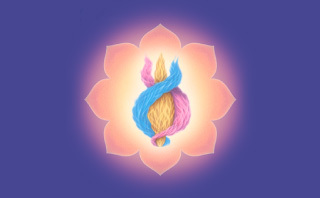 Rather than advocating the blending of all nations into a one-world type of government, Saint Germain teaches us that the individual genius of every nation must be preserved as a crucible for individual self-government and that the types of self-government that people evolve must be unique to their own souls' evolution. Our form of government is not necessarily the best for every nation, nor should we try to have some sort of a world-elite body ruling peoples who ought to be ruling themselves and who ought to be taught the way of self-government. Saint Germain sees World Communism as the greatest threat to individual freedom, especially the freedom of the soul to walk the path of initiation with the Christ and the Buddha. Where that freedom is denied, the purpose for life and for living is lost and then the very purpose for the perpetuation of earth itself is lost. Every soul on earth is intended to be free to attain reunion with God. Where that freedom is denied, those who deny it must be challenged. Saint Germain is fervent about this because the people of the world today are in embodiment to inaugurate a new age—two thousand years when the flame of freedom in science, education, art and culture must be extolled. So we as a people and as a government cannot compromise. We cannot sit at the table with the enemies of freedom and proceed to give away entire territories and nations and actually seal the fate of millions of souls in the hands of those who are the tyrants. These tyrants exist in both the East and the West. Saint Germain says that we need to watch our representatives in government, we need to watch those who are not actually continuing the purposes for which America was founded and that we realize it is more than material freedom that must be guarded: it is spiritual freedom. Those policies that seem correct in the way of socialism may not seem correct when we understand that the purpose of America is to champion the free enterprise system. 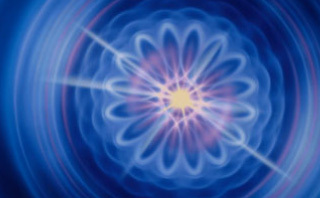 That system gives the maximum opportunity for the individual to develop the Christ-potential within himself. As soon as the government or large corporations are doing for the individual what he can do for himself, he is being deprived of his freedom—his freedom to create. Saint Germain teaches that without the freedom to create there is no freedom. The opportunity to create is the basic endowment we have with the gift of free will. When you have a government that provides everything the individual needs so that he does not have to exercise the muscles of the mind or of the soul or even move himself, then the energies of sloth, self-centeredness and the pleasure cult set in. The danger of the pleasure cult in America today is greater than ever. What can the individual do in defense of freedom right now? It is important for people of every religion to realize that this form of impassioned plea to the Almighty is a fiat that is made in the name of the Christ and one's own Christ Self. You can make fiats while you are driving your car, cooking dinner, doing your ironing or taking a shower. Whenever you have a moment, whenever you hear a news report of some dire calamity, immediately make a call in the name of the I AM THAT I AM to one of the ascended masters, to Almighty God himself, and know the infallible law of the cosmos that declares: The call compels the answer!